The days where forms had to be boring are definitely over. 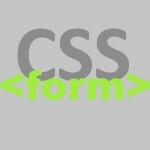 Instead, forms can and should be part of the overall design. We are not designers, we just like pretty things (and pretty code). And we like it best if it all is functional and adds to the experience without limiting it. And while we do use jQuery for certain effects on other sites, these a pure CSS solutions. Everything described here we are using in the comments form at the bottom of this page. We are using a blank sprite (without any text); this way we can simply assign what we want to appear *on the button* to the button’s value in our HTML code instead of having to create a variety of different images. We are NOT using the sliding doors technique (first introduced in 2003) to create variable width buttons. We create a submit button, and (we like it simple) add an id with the value *submit*. If you have more submit buttons on your site, create a class for them and automatically apply the definitions to all your submit buttons. Remember: an id must be unique to the page. 1: Add a selector for the previously assigned id “submit” (#submit). 2: Set the border to 0. Otherwise, your browser will display the default border around the element. start displaying the image starting at 0 px from the left and 0 px from the top (You can also use “top left” instead of 0 0). Note/Disclaimer: While IE 6 will display the background image, it does not recognize Alpha transparency in PNG files. If you need to match the background-color of your element, create your sprite with a matching background. IE 6 also does NOT recognize the :hover pseudo-class. Font color and background image do not change in IE 6. IE 7 does recognize :hover, but still doesn’t recognize :focus (which we will use in the next part). « Got WordPress (on my mind)? That’s what I have been looking for. Thanks for it!